The Third Carriage Age: From Coast to Coast – in an Auto-Mobile! The first successful cross-country automobile trip, in 1903 (photo from Wikimedia Commons). Tomorrow, Delphi Automotive, a car parts supplier, plans to launch the first coast-to-coast trial run of a driverless car. In an apparent nod to history, the trip will begin in San Francisco and end in New York City, just like the first successful cross-country automobile trip over a century ago, in 1903. Mind you, the trips won’t be quite the same. But there are many interesting parallels. The 1903 journey started off with a story straight out of Around the World in 80 Days. Society men gathered in San Francisco’s elite University Club were debating, most likely in a haze of cigar smoke, just how long of a trip could be made in the new-fangled “horseless carriages.” A young doctor, with the dashing name of Horatio Nelson Jackson, leaped up and vowed that an automobile could be driven from one coast to the other, and that, furthermore, he would prove it by making the trip himself. There were just one or two problems. Horatio did not own a car, and didn’t even really know how to drive one. When Delphi’s “driverless” car starts its trip tomorrow, it will need a team of human minders to make sure it actually finishes in one piece. Likewise, young Dr. Horatio also needed a human minder, and for this he hired Sewell Crocker. Sewell Crocker was, if anything, an even more fascinating character than Horatio Jackson. Sewell was a professional chauffeur – which meant, in those days, that not only did he know how to operate a motor car, he also knew how to fix one when it inevitably broke down. Smart automobilists never went anywhere without at least one competent chauffeur in the vehicle. (Delphi’s car will travel with a team of six engineers). Sewell had gotten into this line of work as a cycling enthusiast back in the bicycle craze of the 1890s. Although today we think of “bicycles” and “cars” as two distinct, even antagonistic technologies, in those days they were seen as aspects of the same phenomenon, loosely termed “horseless carriages,” “auto-mobiles,” “moto-cycles,” and so on. From Sewell’s perspective it was probably not a big transition to go from bicycle racer to chauffeur-mechanic for the new, gasoline-powered form of horseless travel machine. Horatio and Sewell made their trip in just over two months, leaving San Francisco on May 23rd, 1903, and arriving in New York City on July 26th. Their automobile, a Winton Touring Car named “Vermont,” broke down innumerable times. Along the way, they picked up an adorable bulldog companion named Bud. Amazingly, there has never been a Disney movie based on the adventure (though there is a Ken Burns documentary, of course). Delphi expects their vehicle to make the trip in 8 days, driving only in daylight hours for best visibility. Among the advantages over 1903 are not just improved automotive design and reliability, but a complete, nation-wide highway system. Horatio and Sewell (and Bud) made their trip on dirt roads when they were lucky; the Vermont also had to clamber over rock and wade through mud. It’s a fair bet that Delphi’s souped up Audi SQ5 – dependent, as today’s “autonomous” vehicles are, not only on built-in sensors but a pre-built and predictable infrastructure of modern streets and highways – could never have made the trip under 1903 conditions, with or without a team of engineers. There are a few more links to be seen between the 1903 trip and the one starting tomorrow. Assuming Delphi’s trip goes well, we can assume a media campaign is waiting in the wings to trumpet the success far and wide. Audi commercials, in particular, will be sure to remind us what kind of car made the journey. Horatio and Sewell started off without much fanfare, but (like Don Quixote and Sancho Panza?) became celebrities when they were still half-way through their adventure. The Winton Motor Carriage Company, in particular, was quite happy to feature Horatio and Sewell (and especially Bud) in their own advertisements, even though their product had been chosen for little more reason than because Sewell had driven one before. One last link: The Winton Motor Carriage Company, manufacturers of the Vermont, was later absorbed into General Motors, of which Delphi Automotive is a former subsidiary. 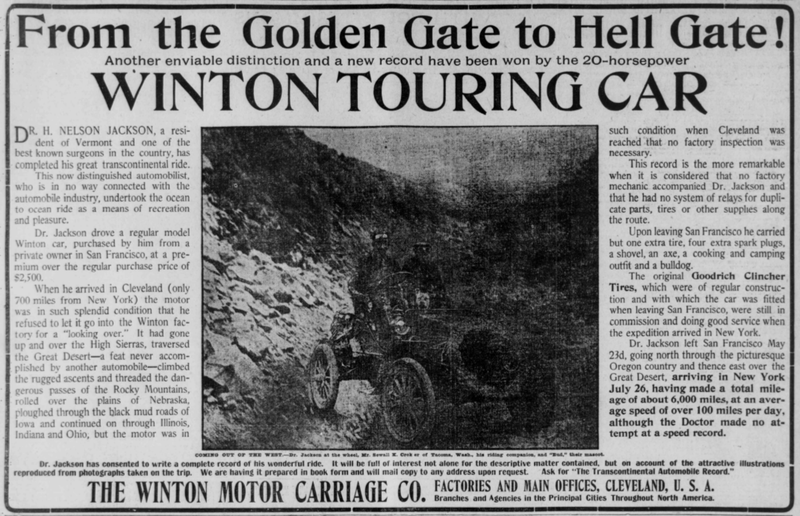 Winton Touring Car advertisement, San Francisco Call, August 5, 1903.